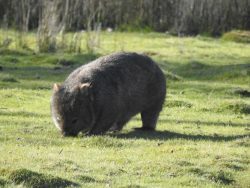 Tasmania – tours, accommodation, parks etc. 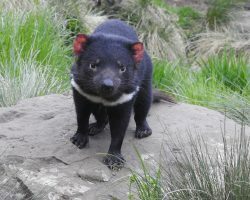 The world’s largest carnivorous marsupial (Tasmanian devil), its smaller relative the eastern quoll, the forty-spotted pardalote, yellow wattlebird, and many other species are endemic to Tasmania (i.e. found nowhere else). Regrettably the “Tasmanian Tiger” or Thyalacine, a large carnivorous marsupial that still roamed the island at tie of colonisation, became extinct in the 1930’s, but there is much wildlife still here to see. With magnificent mountain scenery, wild coasts, tall lush forests and a splendid display of springtime wildflowers, this island state is a wonderful place for the nature lover and photographer. One of the most accessible places to see a wild Peregrine falcon in Australia is right in the heart of Hobart, Tasmania’s capital city. The city itself has a lovely, easy-going atmosphere, unlike the hustle and bustle of many other major cities, and there are some good scenic walks close by. There is no shortage of wildlife parks or places to view animals in the wild, as you’ll see from our members’ listings. 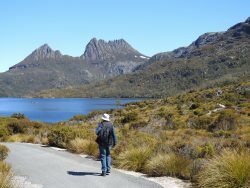 Cradle Mountain and the neighbouring Lake St Clair and Dove Lake form a wonderful area for exploring forest trails, looking for birds, wallabies, echidnas and wombats (and maybe devils at night) and just enjoying the utter beauty and diversity of the region. The southwest corner of Tasmania provides great opportunities for experienced bushwalkers to spend several days in the wilderness. If you don’t want to rough it, you can still see some of the western wilderness by taking a boat ride through the forests along the Gordon River from Strahan. 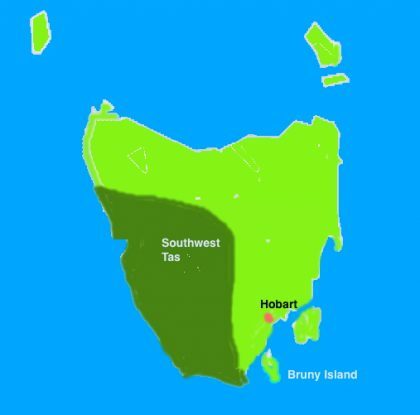 Bruny Island, off the southeast coast, is famous for its birdlife, including almost all the bird species endemic to Tasmania. Inala Nature Tours provide excellent services helping you find the birds. Along the coast you may encounter migratory shorebirds from as far afield as Siberia. Look for plovers, oystercatchers, black swans, egrets, cormorants, pelicans, terns, shearwaters and birds of prey. The coastline is also home to numerous marine mammals including dolphins, Australian fur seals, Southern right whales and Humpback whales, as well as little (fairy) penguins. Tasmanian waters may be colder than other parts of Australia, but offer some of the world’s greatest biodiversity in temperate waters for diving enthusiasts. There are a number of dive operators that can help you explore this fascinating region.